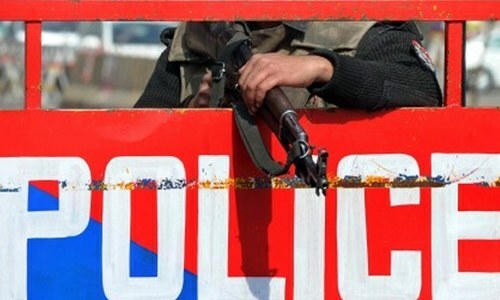 A young male resident of Mian Channu, Khanewal, has accused local police of torturing him on the suspicion that he owned weapons illegally, DawnNews TV reported on Wednesday. The victim, Adnan, said he was taken to the Talamba Police Station on Tuesday, where officials tied him to a charpoy and beat him with sticks and shoes over the night. He said he still bore bruises on his back from the torture. He claimed that the police had tortured him to force a confession that he owned unlicensed weapons. Five police constables and an assistant sub-inspector were involved in the torture, Adnan said, adding that the investigation officer seemed to be drunk. A medical examination report from the District Headquarters (DHQ) Hospital confirmed that Adnan bore marks of torture on his body. The docket that allowed Adnan to get a medical examination from DHQ Hospital was issued by a district magistrate after the police refused to do so. As per the procedure in cases of this nature, the police must issue a docket to the complainant to get a medical examination from DHQ Hospital. Following Adnan's allegations, the residents of the area have been protesting against police brutality. Deputy Superintendent of Police Falak Shabbir had said that he does not have enough information about the incident and will investigate. According to a police spokesperson, District Police Officer (DPO) Faisal Mukhtar took notice of the incident later in the day and suspended Additional Sub-Inspector Muhammad Ashiq. The story initially stated that the medical examination of the victim was held at a private hospital, instead of the DHQ Hospital. That error is regretted. Anything abnormal ??? That's what our police does so well. DSP doe snot have enough information...he is obviously incompetent and has no idea what is going on under his nose. Perhaps he should not be given any responsibility. That's the malpractice of the police department leading people into confession that they haven't done it. @Rev. Eldrick Lal tell them to come this way and try it. This is a normal way of Punjab police during a course of investigation. This should be abolished.